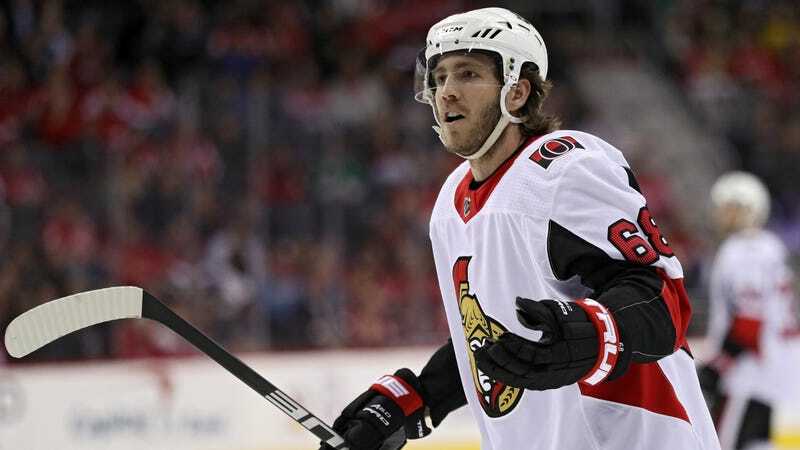 In an obvious, inevitable move, the Ottawa Senators dumped longtime forward Mike Hoffman this morning in a trade to the San Jose Sharks. In the deal, the Sens got a replacement winger in Mikkel Boedker, defensive prospect Julius Bergman, and a late draft pick. More importantly, they also got the chance to eliminate the source of a bizarre controversy from earlier this month, when Melinda Karlsson, wife of Ottawa franchise player Erik Karlsson, filed an order of protection against Monika Caryk, Hoffman’s fiancée. The order, whose claims Hoffman denied, said that Caryk had used anonymous Instagram accounts to continuously harass the Karlssons, including after the death of their stillborn child. While one or both of the well-paid veterans was already expected to get dealt from the disaster that is the Senators this offseason, Melinda Karlsson’s accusations made the decision to get rid of Hoffman a hell of a lot easier. And the Sharks, at least for a moment, got to make a bit of a splash with their acquisition. The immediate AP writeup compared the trade to San Jose’s Evander Kane deal, saying, “This trade shows San Jose GM Doug Wilson isn’t afraid to take on perceived problems to acquire talent.” NHL Twitter quickly got to speculating about how the salary taken on by the team could affect a free agent pitch from the Sharks to John Tavares, or Ilya Kovalchuk. But that prognosticating lasted all of about two hours, as the Hoffman move, from the Sharks’ perspective, turned out to be just a complicated way to erase Mikkel Boedker’s $4 million salary from the payroll. In a deal that’ll end up looking pretty crafty if San Jose can land a big-name free agent, the Sharks dealt Hoffman and some draft picks to the Florida Panthers in return for some other draft picks. On the Panthers, Hoffman will get to hang around and try to contribute on a habitually underachieving team still reeling from getting utterly owned by Vegas in the expansion draft last year—that is, assuming the Panthers are the team he actually plays for this season. Hopefully Hoffman didn’t spend any time getting attached to Bay Area rental listings this morning. But even with the sudden change of direction, at least he’ll still get to enjoy some sun.